Clear Width – Door openings shall provide a clear width of 32 inches minimum and a maximum of 48 inches. Clear openings of doorways with swinging doors shall be measured between the face of the door and the stop, with the door open 90 degrees. Openings more than 24 inches deep shall provide a clear opening of 36 inches minimum. Exception: Doors and doorways designed to be operated only by security personnel shall not be required to comply. Double-Leaf Doors – At least one of the active leaves of doorways with two leaves shall comply . Door Surface – Bottom rail must be at least 10 inches from the finish floor and have a smooth surface on the push side extending the full width of the door. Parts creating horizontal or vertical joints in these surfaces shall be within 1/16 inch of the same plane as the other. Cavities created by added kick plates shall be capped. There shall be no projections into the required clear opening width lower than 34 inches above the finish floor or ground. Projections into the clear opening width between 34 inches and 80 inches above the finish floor or ground shall not exceed 4 inches. Door closers and door stops shall be permitted to be 78 inches minimum above the finish floor or ground. Door Hardware – Handles, pulls, latches, locks, exit devices and other operable parts on doors shall comply – Operable parts of such hardware shall be 34 inches minimum and 48 inches maximum above the finish floor or ground. Operable parts shall be operable with one hand and shall not require tight grasping, pinching, or twisting of the wrist. Most lever-operated mechanisms, push-type mechanisms, and U-shaped handles are acceptable designs. The force required to activate operable parts shall be 5 pounds (22.2 N) maximum. Door hardware that can be operated with a closed fist or a loose grip accommodates the greatest range of users. Hardware that requires simultaneous hand and finger movements require greater dexterity and coordination, and is not recommended. 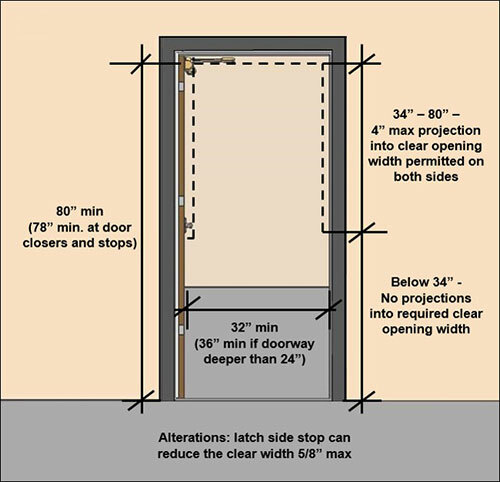 Closing Speed – If a door is equipped with an automatic closing device; Door closers shall be adjusted so that from an open position of 90 degrees, the time required to move the door to a position of 12 degrees from the latch is 5 seconds minimum. Spring Hinges – Door spring hinges shall be adjusted so that from the open position of 70 degrees, the door shall move to the closed position in 1.5 seconds minimum. Door Opening Force – Fire doors shall have a minimum opening force allowable by the appropriate administrative authority. The force for pushing or pulling open a door or gate other than fire doors shall be as follows: Interior hinged doors: 5 pounds (22.2 N) maximum. These forces do not apply to the force required to retract latch bolts or disengage other devices that hold the door in a closed position. The maximum force pertains to the continuous application of force necessary to fully open a door, not the initial force needed to overcome the inertia of the door. Vision Lite Placement – Doors and side lights adjacent to doors, containing one or more glazing panels that permit viewing through the panels shall have the bottom of at least one glazed panel located 43 inches maximum above the finish floor. Exception: Vision lites with the lowest part more than 66 inches from the finish floor or ground, as these types of lites are used for for light transmission only. 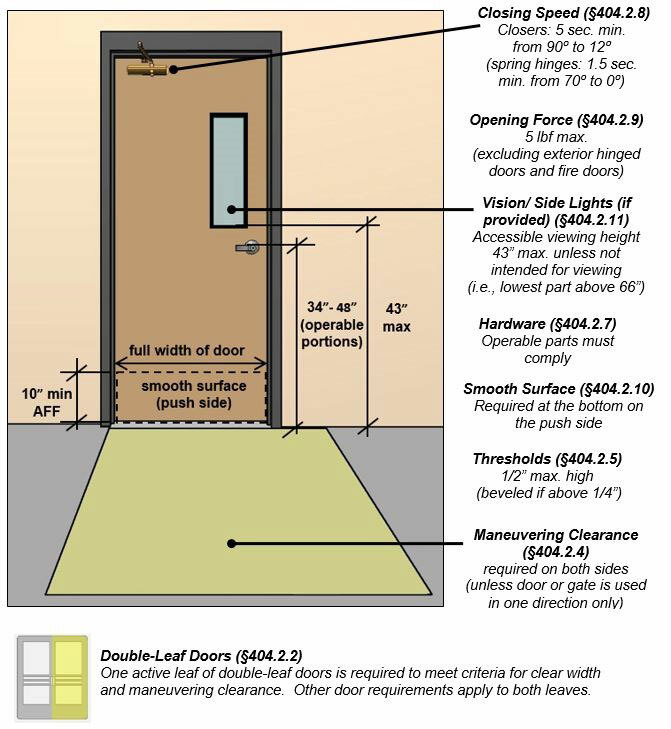 Thresholds at doorway – Thresholds, if provided, shall be 1/2 inch high maximum.